In many cases, rap and hip hop have vastly degraded, featuring lazy instrumentals and uninspired lyrics. Though many have succumbed to the monotony of manufactured hits, there are still several underground and genuine hip hop artists who are keeping the genre alive. The West Coast hip hop movement is still thriving with artists such as CookBook of L.A. Symphony and Evidence of Dilated Peoples whose moving flowetry is set to thick and complex instrumentals. CookBook's career in music began in the early 2000s as a member of the hip hop group, L.A. Symphony. It was through the group that he developed his style and gained experience while also understanding the importance of camaraderie. As his career progressed, he always found a way to maintain balance between his loyalty to the group and his growing talents as a solo artist. Though most of his passion now lies within his solo work, he still appreciates the importance of collaboration by continuing to work with various artists. 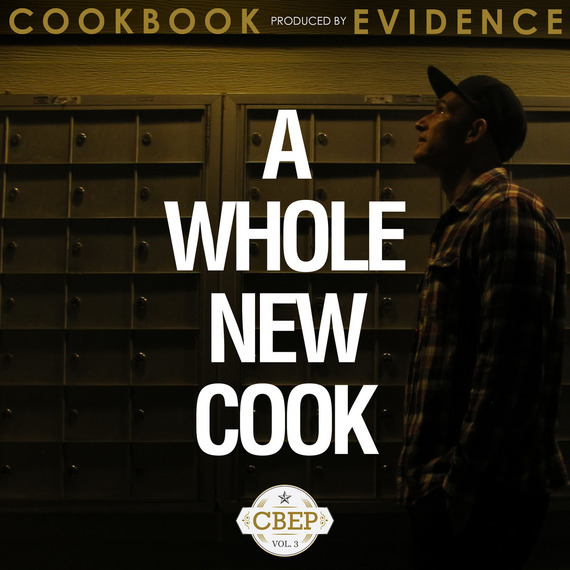 CookBook and Evidence have recently released their latest collaboration, A Whole New Cook with Just-Us Movement Records. This nine-track EP is the newest installment of an ongoing project that CookBook has been working on which features a different producer for each installment. His past projects include Phantom Menice which showcased DJ Rhettmattic of Beat Junkies and Yes which showcased rapper and producer, Blu. By collaborating with different artists of varying styles, CookBook is not only establishing strong creative bonds but also friendships. The rotation of minds and methods is an inspiring way to keep art fresh and prevent stagnancy. It is also an important element for the creative mind as it teaches adaptation, cooperation and innovation. That being said, A Whole New Cook is chock-full of cameos from Madchild of Swollen Members, LMNO of The Visionaries, and DJ Babu of Dilated Peoples along with a quick drop-in from Evidence as well. The instrumentals and production on this EP, which are deep, layered and moving enough to stand alone, are the soul of the album while CookBook's velvety flows are the heart. Each word smoothly drips from his lips as the listener glides along with him through the many facets of his personality. With a slightly darker and grittier sound than most of CookBook's past work, this EP highlights one of Evidence's truest talents: his skill of arrangement. Like a film editor who takes beautiful footage and crafts it into a narrative, Evidence pieces together each song into a masterful and cohesive collection of tracks. The track "Preachers Of L.A." combines a heavy, swaying beat with old gospel sensibilities creating a sound that is both potent and nostalgic. Then, seamlessly, the track "Philip Drummond (feat. Evidence)" begins with a mellow rhythm that is likened to producers such as the legendary J Dilla. The combination of CookBook's rhymes and Evidence's production creates hip hop that is both graceful and hard. Honest and defiant, never to be a "velociraptor rapper" and always throwing down with "Sid viciousness," CookBook integrates satire and comedy through his stylistic flows in tracks such as "CookBook Got the Answers." His rhymes and wordplay are creative and never recycled, always speaking with the unapologetic voice that the genre of hip hop was based upon. A Whole New Cook is both insightful and introspective, reminding us of the evocative power of hip hop. If it's not moving, it's not music.